In its propaganda magazine, the Islamic State terror group carries a picture of Pastor Robert Jeffress' First Baptist Church and incites its followers to carry out an arson attack on the megachurch in Dallas, Texas. The Rumiyah magazine of Islamic State, also known as IS, ISIS, ISIL, or Daesh, talks about fire as a weapon and calls the 12,000-member First Baptist church "a popular Crusader gathering place waiting to be burned down." "Arson attacks should in no way be belittled. They cause great economic destruction and emotional havoc and can be repeated very easily," an article in the magazine says. First Baptist said it would not be deterred by the threat, according to NBC 5. "The Bible tells us the Lord has not given us a spirit of fear. If we surrender to fear, ISIS wins. We will continue doing what the lord has called us to do...," the church was quoted as saying in a statement. 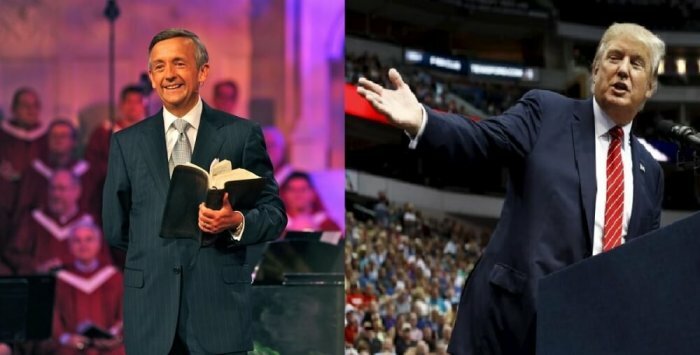 The church's senior pastor, Jeffress, campaigned for President Donald Trump and is part of Trump's evangelical advisory board. Hours before Trump was sworn in as the 45th president of the United States, Jeffress gave a sermon at St. John's Episcopal Church across the street from the White House. The pastor quoted the Old Testament account of Nehemiah's rebuilding of the walls of Jerusalem to prevent enemy attacks. The remarks captured numerous headlines, considering Trump had stated that he would boldly build a wall on the southern border of the United States. In an interview with The Christian Post later, the pastor explained that the point of his sermon was not so much about building walls but rather that God blessed Nehemiah, a builder, to be governor of Judah for a "unique" purpose. "I know the liberals would love to take it out of context. But look, the point was God was the one who raised up Nehemiah, who was not a politician, who wasn't a priest, who was a builder, and gave him a job to do," Jeffress said. "There is nothing unbiblical about building a wall and protecting citizens. What I concentrated on in my message to Mr. Trump and Mr. Pence and their cabinet was the fact that God blessed Nehemiah for some unique reasons. That is what the center of my message was, not just the wall." In 2015, Jeffress condemned President Obama for comparing Christianity to the atrocities being committed by ISIS. "I would imagine that Jesus would be outraged that the president would willfully mischaracterize a movement like Christianity that bears Christ's name," Jeffress said on Fox News' "The O'Reilly Factor." "I believe that Jesus, who said that it would be better to be cast into the sea than to harm a child, would be incensed that Obama would dare link Christianity to ISIS, an organization that tortures children, buries them alive and crucifies them. I think he'd be outraged by it," Jeffress said. During his speech at the 63rd annual National Prayer Breakfast, Obama said, "… [L]est we get on our high horse and think this is unique to some other place, remember that during the Crusades and the Inquisition, people committed terrible deeds in the name of Christ. … So this is not unique to one group or one religion. There is a tendency in us, a sinful tendency that can pervert and distort our faith."